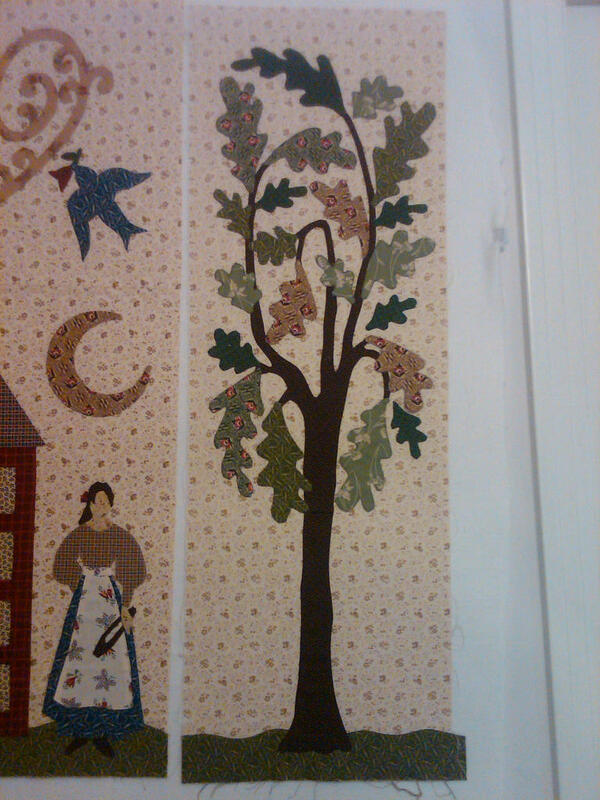 However, I’m going to take a break this week from applique and try to complete two other projects. 1 – I have machine stitched the binding to my MIL Stars and Stripes quilt. I need to finish it by hand sewing it to the back and add a label. MIL is visiting us in two weeks, so I have a definite deadline! Pictures when I’m done! 2 – I have almost finished all the blocks for my jelly roll quilt with the Avalon fabric collection. They look great! I can’t help myself but to square up after each round of strips though. Slows me down, but hopefully it is worth it when I go to put it all back together. Cheater trick, I’m going to make my final two strips about a 1/4 inch larger (they are both in the background fabric) before I sew them on. That way, if my blocks try to come up a little short anywhere, I have the extra fabric to keep them at an exact measurement. ← I want to do what I want to do! Your block is so beautiful! Thank you for using both machine and needle turn. I thought there were strict rules about that… and I would embrace applique more if I knew that I had options!!! I can’t wait to see your Avalon project. I can’t believe that you are nearly done with it! That fabric is so beautiful. I can’t wait to get my hands on some! I have a great idea for my Sinta bundle now… I’ll blog about it soon I hope. It will be something for my daughter that I found on the Moda website. I love that you combined techniques! No rules is my mantra. 😉 I just got an Avalon charm pack in the mail – I was inspired by your project. I’m just enjoying looking at it right now! My combined techniques was mostly due to the fact that I didn’t have an exact match of thread for my dark green leaves, so I felt that I needed to hand applique them to hide the thread as much as possible. But it all worked out! Sorry I missed the meeting this past weekend – I hope to try again next month. YOUR BLOCK IS SO BEAUTIFUL ! Thank you very much Brigitte! Your block is beautiful! I enjoy applique but would consider myself a beginner. You have quite an ambitious project there and I like the fact that you used two different techniques. Thank you Sherry! I still consider myself a beginner as well. If you go slow enough, you can look better at it than you are!